Nancy Pelosi hasn't read the meme memos from the White House. Blaming Bush is out, blaming Congress and the Koch brothers are in. 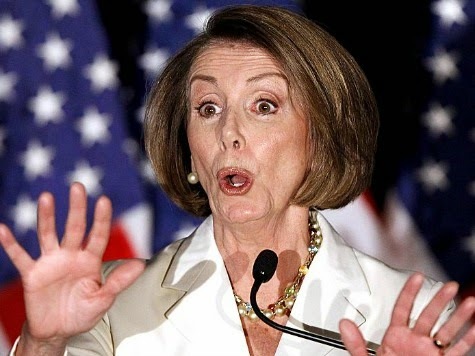 Still, Pelosi could not resist assigning blame for the Veteran's Affairs scandal on long gone president Bush. The same administration that gave ample warning to president Obama before leaving the White House, that a problem was evolving. Pelosi took a shot at Bush while saying that the scandal is a high priority for Obama. "He sees the ramifications of some seeds that were sown a long time ago, when you have two wars over a long period of time and many, many more, millions more veterans," she told reporters during her Thursday press briefing. "And so, I know that he is upset about it." The Democratic leader never mentioned Bush by name, but she alluded to him early and often in the press briefing. This far into the chronology of this administration, and this far into yet another scandal, Democrats are still too focused on deflecting blame and not focused enough on working out solutions. When your modus operendi is all politics, you simply can't be bothered to fix anything, and consequently, you don't.